Strawberries are in season now, so don’t miss out. Here are some tips on the best varieties, how to store them, along with an easy spring recipe from the Chef’s Studio. Baskets and baskets of strawberries! 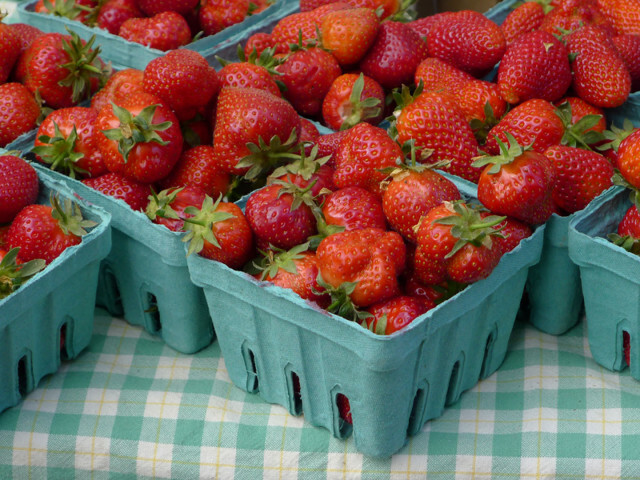 Local markets are filling up with strawberries, the wonderful berry that seems so fleeting here in Oregon. As soon as it gets too hot, they ripen in the fields and are done in a matter of days. Wild strawberries are my favorite, but the closest thing to those rare beauties are the Hood variety, more difficult to grow and to ship. When shopping for strawberries, I choose organic for my family as non-organic strawberries tend to get the highest residual pesticide ratings. Right now, some of my favorite strawberries from the farmers’ markets are the Seascapes from Deep Roots Farm (also available at Food Front), and the Honeoye from Viridian Farm. Groundworks also grows delicious organic strawberries. Because of the late warm season this year, the Hoods are taking longer to ripen and sweeten, but don’t give up yet, we’re almost there. Farmers are saying another week or two at the most. Don’t let strawberries sit around too long. They must be eaten within a few days. I find the best way to store them is out on the counter for one day. Unless the berries are fully ripe, one day at room temperature brings up the sugar level a bit. Then, place a paper towel in a container or bowl and gently spread the berries around, placing the harder, large ones on the bottom. Cover the top with a paper towel and store in the refrigerator. My favorite way to eat strawberries is plain or with creme fraiche. I’m not a huge fan of the cooked sort. However, they do bring a lot of sweetness to a rhubarb tart or a compote of any kind. Here’s a springtime recipe from the Chef’s Studio for a delicious dried and fresh fruit compote. It’s perfect for these long cold springs when summer fruit is just around the corner. Also don’t miss the kid’s cooking class at PSU Farmer’s Market July 9th, where berries are turned into a fresh summer salad. Put prunes and raisins in a 1-quart bowl. Add grated lemon rind. Moisten with brandy and let sit for 30 minutes to an hour. Just prior to serving, add jam, mixing with brandy to create sauce-like texture. Add strawberries and cherries and mix well.